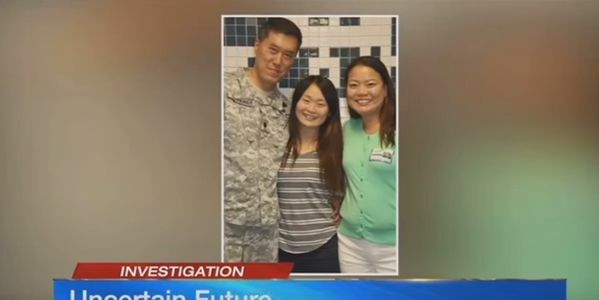 In 2012, Lt. Col. Patrick Schreiber of Lansing, Kansas brought his South Korean-born niece Hyebin to the United States. Her biological family was struggling, so he and his wife Soo-Jinn decided to adopt her. But then he was deployed to Afghanistan to serve as an intelligence officer where he spent the majority of 2013 and 2014. After consulting with his immigration lawyer, he decided to put the adoption process on hold until he returned. Under Kansas law, a child must be adopted before their 18th birthday, but adoptions of foreign-born children are handled by federal law. And according to federal statutes, a foreign-born child must be adopted before they turn 16 in order to gain citizenship from their adoptive American parents. The technicality could cost the family everything. Since Hyebin was already 15 when she arrived to the States, by the time Schreiber returned, her 17th birthday had already passed. So even though she was legally adopted under Kansas state law, the federal government didn't recognize the adoption nor her U.S. citizenship. The Schreibers took their immigration fight to court but last month, U.S. District Judge Daniel Crabtree ruled against them and Hyebin has been ordered to leave once she finishes university. Lt. Col. Patrick Schreiber's only mistake was thinking that the country that he went to fight to defend would defend him too when it mattered. He made a simple mistake and now it may force his daughter to leave the United States, a place she has called home since 2012. Schreiber says that if they aren't able to convince the court to change their mind, then he would rather move his entire family to South Korea than allow his daughter to return there alone. This is not right. The fact that a technicality might ruin this American hero's family is a clear injustice and the U.S. Citizenship and Immigration Services should allow Hyebin to stay.